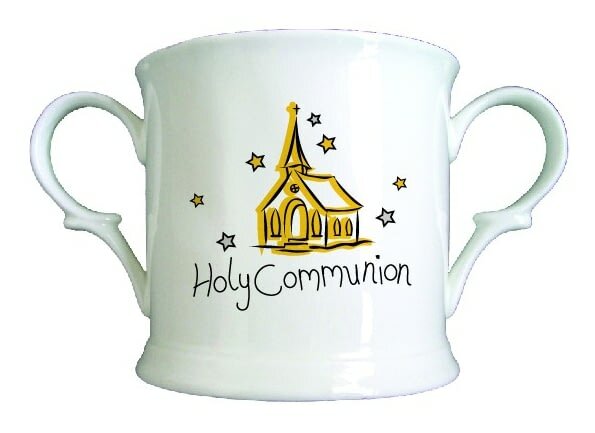 A loving cup decorated with a colourful church design makes a perfect gift for a little one's Communion day. With your message included on the back of the cup this church themed loving cup will stand proud on the mantle until they're old enough to use it. A loving cup decorated with a colourful church design makes a perfect gift for a special day. A bespoke gift for a special someone who played a principal part in the wedding. A loving cup decorated with cute blue stars and a cuddly blue teddy makes a perfect gift for a little boy's christening day. This cute bone china loving cup makes the perfect keepsake for that special occasion.